JOHANNESBURG, Feb 2 2011 (IPS) - Crouched on their haunches on the edge of a crumbling pavement, a group of Chinese construction workers are eating noodles from tin bowls, wearing floppy straw hats under their green safety helmets to protect them from the aggressive midday sun. The men, slim and in their 40s, sit in their in greying overalls, seemingly oblivious to the noxious fumes of the throng of traffic passing them by. 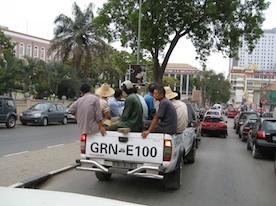 Welcome to Luanda, capital of Angola, China’s largest trading partner in Africa. Walk down any street of the overcrowded and congested city and you will come across a Chinese construction site. Even in the most remote rural areas it is not unusual to see red Chinese lanterns and hand-painted Mandarin road signs. Chinese companies are involved at all levels of construction, from repairing roads, railways and airports, building football pitches, schools, hospitals and government offices, and even creating entire new residential suburbs. Sino-Angolan relations took off at the end of Angola’s three-decade conflict in 2002, when the Portuguese-speaking country was desperate for cash and know-how, just as China was embarking on its “Going Out” strategy of securing natural resources and new investment markets. In 2010 trade between the two countries was just under 25 billion dollars; in the past seven years more than 10 billion dollars of Chinese credit has been extended to Angola, with the latter paying back its debts in oil. But as China’s presence in Angola has grown, so too has Western suspicion, and even though Brazil has also extended oil-backed credit to Angola, it is China that has been labelled in some quarters, particularly the U.S., as resource-hungry and neo-colonialist. Lucy Corkin, a research associate at the University of London’s School of Oriental and African Studies (SOAS) Africa-Asia Centre, said much of the “hysteria” around Sino-Angolan ties was based on “confusion about what is Chinese investment and what is Chinese aid”. In November last year, China’s vice president Xi Jinpeng (who is widely tipped to take over from Hu Jintao), visited Angola on a tour of Africa which also took him to Botswana and South Africa. In a joint statement at the conclusion of the visit, much was made about the development of a “strategic partnership” to “jointly seize opportunities and tackle on challenges facing the new international context”. Such “challenges” and “opportunities” were discussed on Jan 31 in Luanda at a high-level conference organised jointly by the University of Durham, the Centre for Scientific Studies and Investigation (CEIC) at the Catholic University of Angola and the South African Institute of International Affairs (SAIIA). Organiser Dr Marcus Power, from the University of Durham, told IPS: “Although there is a lot of academic research about the relationship between the two countries, there has been a real lack of dialogue among Angolans. Reliance on imported labour, no local job or skills creation and a lack of transparency on how the credit lines are managed, including allegations of misappropriation, are some of the major concerns being voiced in Angola. Although most people welcome the new roads and infrastructure, questions are being asked about long-term sustainability. The new Luanda General Hospital, built four years ago at a cost of eight million dollars, had to be closed down due to subsidence. Six months later, patients are still being treated in tents and repair works at the hospital are yet to begin. Power, whose research has examined a number of Chinese housing projects in Angola, also has his concerns: “There seems to have been little consultation with Angolan people and communities about many Chinese construction projects. Whenever criticised about its Africa policy, China’s response is that the set up is “win-win”, that China benefits as much as the African country where they operating. Angola, while rarely taking the bait of international criticism, highlights the amount of physical reconstruction it has been able to achieve while, between the lines, it hints that other countries had the chance to get their foot into one of the world’s fastest-growing economies, but chose not to.